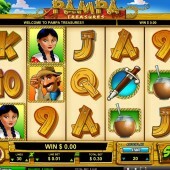 A barren region of Argentina famed for its meat, or a posh restaurant famed for its meat (depending on where you’re reading this), La Pampa is the inspiration behind Leander Games’s video slot. 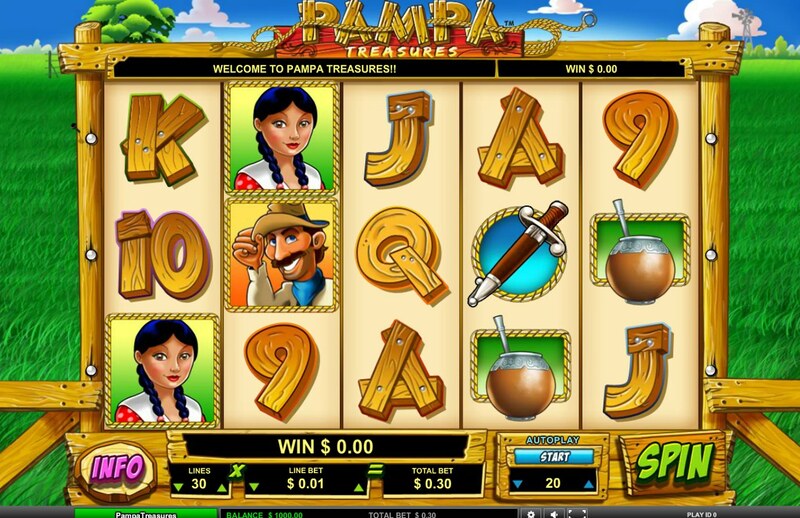 A 5 reel, 30 pay-line video slot from the developers behind similar kiddie-friendly fare such as Glutters, Pampa Treasures is set on a vast ranch with a range of cute characters doing the rounds. There’s a dog and puppy as its main characters, with their owner, the South American ‘gaucho’, his wife, and other appropriate imagery such as the rancher’s knife, his horse, and some suitably rustic 10-through-Ace symbols. The crazy dog is Wild, and in customary Leander Games fashion, he awards a top whack of 5,000x your line bet if you hit five across the reels. But there's more - after each spin an extra 'Puppy Wild' can appear on the reels to award you even more. Both the dog and the puppy substitute for all regular symbols other than the Scatter and Bonus symbols. Three Bonus symbols on reels 1, 3 and 5 triggers either a free spins round or the 'Jineteada' Bonus round. There's a third choice too - a straight multiplier on your win for that spin, anything from 3x - 25x your bet. The free spins round awards 10 spins with a juicy 5x multiplier attached. There are also Expanding Wilds to add to the fun. ... Or 275x Your Total Bet in the Jineteada Bonus! Select the Jineteada (“Rodeo”) round, however, and you will start off with a neat twist on the Pick Em Bonus game where your gaucho must build up his arsenal of horseriding tricks. Get the tricks right and a haul of 275x your total bet can be yours – a potential jackpot of $82,500. In terms of Latin thrills, this is similar to Leander’s Mexican-themed Mad Pinatas (but without the graphical prowess) but the comic madness of Pariplay’s Las Cucas Locas surely beats both for sheer bonkersness.